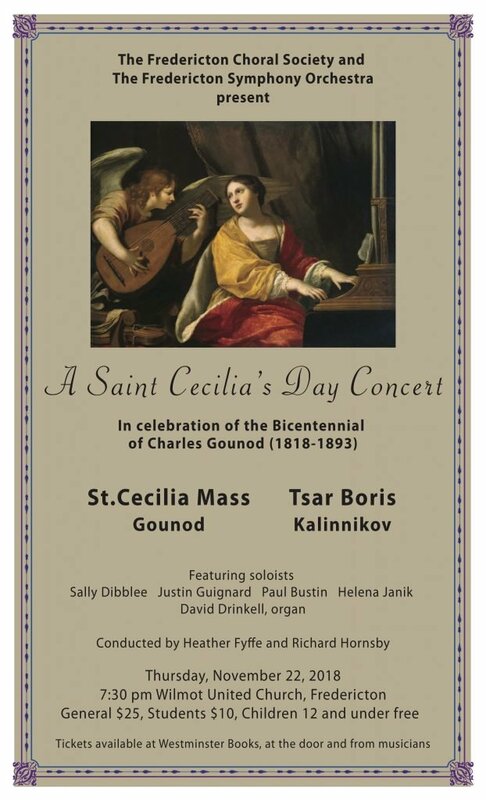 The Fredericton Choral Society and the Fredericton Symphony Orchestra will be presenting A Saint Cecilia’s Day Concert in celebration of the bicentennial of Charles Gounod on Thursday, November 22, 2018 at 7:30 PM. The concert will take place at the Wilmot United Church and features soloists Sally Dibblee, Justin Guignard, Paul Bustin, Helena Janis and organist, David Drinkell. The concert will be conducted by Heather Fyffe and Richard Hornsby. Tickets are available at Westminster Books, members of the orchestra and choir or at the door. Ticket Prices are as follows; General: $25, Students: $10, Children 12 and Under: Free.